The Egyptians built massive pyramids, and the Babylonians instituted the first known written system of laws. The Chinese began a fortified wall that eventually spanned (depending on whom you ask) as much as 13,000 miles, and the people of the Indus Valley? Well, they had an excellent sanitation system. Apparently peaceful, well organized, clean and with a high standard of living, of the four great civilizations of the ancient world, the culture that wrote the book on indoor plumbing remains the most enigmatic today. Arising in Pakistan and western India, the Indus Valley culture eventually covered an area of about 775,000 square miles – larger than either Egypt or Mesopotamia. Towns and cities of this urban civilization have been found as far west as Balochistan and as far east as Uttar Pradesh. 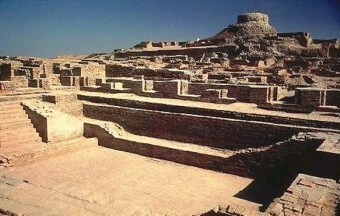 Scholars have also found evidence that the people of the region began to integrate into a single culture, today known as Harappan (named for the first ancient city discovered at Harappa, Pakistan), during this time. Early on, the culture survived by subsistence farming with extensive irrigation systems. To protect their settlements from seasonal inundation, floodwalls were erected, and these eventually became the walls of cities. By about 2800 BC, proto-urban settlements appeared, presumably to house the rapidly growing population. This phase, known as the Kot Diji (named for a site along the Indus River in southern Pakistan) is seen as the period of transition from the Ravi agricultural society to an urban one. Notably, it was at this stage that the Harappan’s unique grid-pattern city planning began to emerge. The Indus Valley civilization reached its heyday beginning about 2600 BC, and it was the remnants of that society that led to its discovery by modern scholars. Prior to finding the cities of Harappa and Mohenjo Daro in the 1800s, most of the world had no idea that a fourth great ancient civilization had even existed. Although some excavations occurred in the 1920s, major excavations of Harappan sites didn’t begin until the 1980s. These have revealed remarkably well-planned cities, built on a grid system with streets and buildings oriented to the four cardinal directions. Putting comfort first, residential areas were separated from public places, and houses opened onto inner courtyards and small lanes, rather than large thoroughfares. Private homes were equipped with toilets and baths, and residents drew water from wells located nearby within the city. Sewage drained beneath the dwellings into covered drains that ran along major city roads, ultimately depositing their contents into agricultural fields. Some scholars have said that the sewage system enjoyed by the Harappan was more efficient than those found in many places in the region today. In addition to cozy homes, the Harappan built large granaries and warehouses, impressive dockyards and even had an enormous public bath. Intriguingly, there are no monuments, temples or palaces, and no obvious seat of a central government. From this, some archaeologists infer that Harappan rulers were not despots, but rather, perhaps, powerful landlords, wealthy merchants or spiritual leaders. Notably, these characteristics are repeated throughout the Indus region, where grid patterned cities, nice housing and good plumbing abounded. As such, it should not be surprising that the Indus people shared a system of standard weights and measures, including the bricks used to build their well-designed cities – they were all uniform in size. To date no remnants of any weapons have been discovered, and the walls of the cities were not heavily fortified like those of their contemporaries in the mid-east. As such, many have speculated that the people of the Indus Valley were peaceful. Others note that since the valley was isolated and protected by mountains to the west, and the lands to the east were not heavily populated, maybe the Harappans were less peace-loving than lucky. Regardless, all agree that since so little of the culture has been revealed, it is possible that later evidence of weapons and war may eventually turn up. On this theme, one of the reasons there is so much speculation is that to date, no single word of Harappan has been definitively translated. Remember that modern scholars only learned to decipher Egyptian hieroglyphics after the discovery of the Rosetta Stone in 1799, and the meaning of cuneiform wasn’t found until the mid-1800s. So, despite having found 400 symbols on Harrappan artifacts, their meanings remain elusive. In fact, since the symbols typically only appear in groups of four or five, and are usually accompanied by an image such as an animal or a religious figure, the brevity of the writing has led some to question whether it is a language at all. In a 2004 publication, Farmer and crew argued that the marks found on Harappan artifacts are not language but examples of non-linguistic symbols. Equivalent to today’s traffic signs, symbols of military rank and icons that represent the weather; these symbols are useful, but fall far short of an actual written language. Farmer and friends support their theory with, among other things, that the lack of language would explain the lack of monumental architecture and large-scale bureaucracy. [ii] As you would expect, this theory has been hotly contested. In any event, by about 1800 BC, most of the cities of the Indus Valley had been abandoned. One popular theory as to why is that the peaceful Harappans (in this theory, of Dravidian descent) were driven out by an invasion of Indo-Europeans from central Asia (the Aryans). In support, adherents point to the fact that the region is now predominantly populated with people of Aryan descent, and that those who descended from the Dravidians, like the Deccan, still suffer from low social status. Many counter this theory and point to other evidence. First, some artifacts recovered from Harappan sites show an image of a man seated in a yogic position and looking remarkably like Shiva, the Hindu god – if the Aryans had conquered the Harappans, why would they adopt the god of the weaklings they defeated? Second, about this time the relatively nearby Sumerian empire suffered a sharp decline due to climate change. Some believe that this change in climate was regional, and may have caused a drought in the Indus Valley that devastated that region’s agricultural production as well. One tangent of this theory agrees that the region’s agriculture suffered, but believes that the Indus River changed course, causing the collapse. Still others opine that a strong earthquake may have hit, causing devastating damage. How Peaceful Was Harappan Civilization? You should do an article on gobekli tepe.